President Donald Trump expressed intent to no longer conduct “very provocative” joint military exercises with South Korea. A top Republican senator claims Vice President Mike Pence backtracked that commitment in a closed-door meeting Tuesday, which Pence’s office disputed. The senator then clarified Pence’s comments. 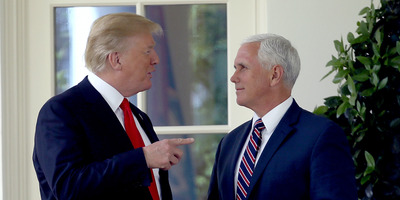 WASHINGTON – Vice President Mike Pence’s message to GOP senators during a closed door lunch at the National Republican Senatorial Committee on Tuesday created a mix up of what exactly President Donald Trump promised North Korean leader Kim Jong Un during initial negotiations in Singapore this week. During the meeting, Trump offered to end the joint military exercise between the US and the South Korean government. Trump called the joint military exercises “very provocative” and dismissed them as a highly expensive practice for the US. After Pence met with Republicans on Tuesday to brief them on the historic summit, Colorado Sen. Cory Gardner told reporters that they were assured joint military exercises would continue. But Pence’s press secretary, Alyssa Farah, said otherwise, and that the vice president said no such thing during the policy lunch. The meeting in Singapore produced a handful of commitments from the Kim regime, including a restated intent to denuclearize the Korean peninsula. However, there were no specifics offered on future plans, which will be a work in progress for the Trump administration if a deal is to be reached.